Fast simultaneous acquisition of low- and core-loss regions in the EELS spectrum from catalyst particles containing the heavy metals Au and Pd using the GIF Quantum system | Gatan, Inc.
Metals such Pd and Pt have been extensively used in the automotive industry as exhaust gas catalyst for pollution control. Until recently Au has never been used due to its thermal instability. 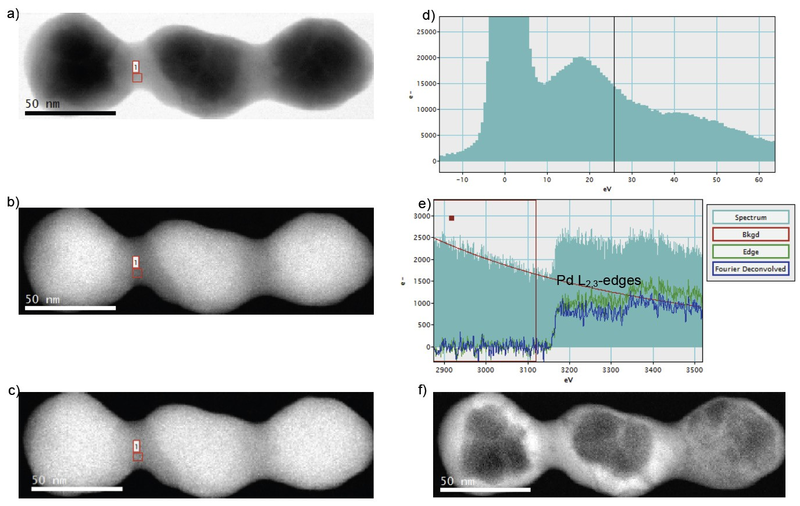 In particular, Au particles at the nanometer scale show a melting point at relatively low temperatures that are much lower than the temperatures experienced during the catalytic process. However, Pd/Au alloys have attracted a lot of interest due to their resistance at high temperatures and this explains their use in several field such as the CO and hydrocarbon oxidation, the synthesis of vinyl acetate monomer, hydrocarbon hydrogenation and many others. Pd is the catalytic center whereas the Au has the effect of changing the chemical properties at the surface of the Pd-Au alloy. This changes influence the catalytic properties. Hence, study of the chemistry and elemental distribution is important to understand properties of the whole catalyst system. 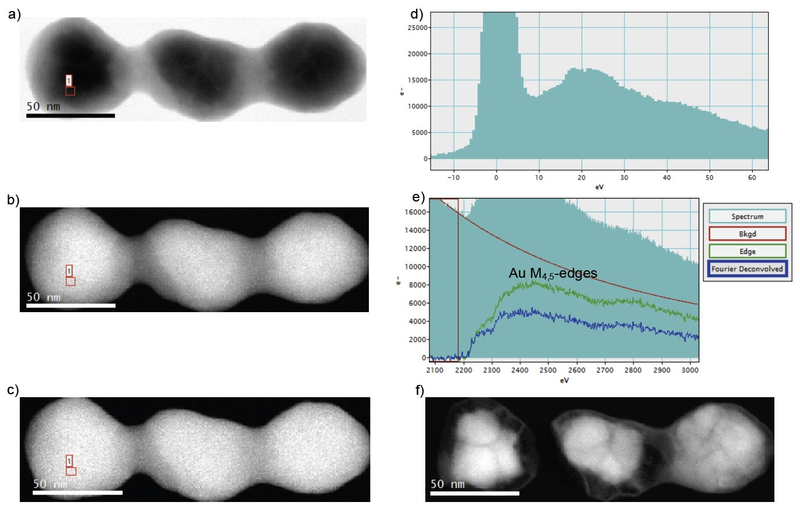 Transmission electron microscope (TEM) related techniques have proved to be valuable tools for characterizing such materials. Traditionally Pd/Au alloys or other particle systems containing high-Z elements such as Au or Pt have been mainly characterized using scanning TEM (STEM) imaging and also energy dispersive x-ray spectroscopy (EDS) for extracting some composition information. Historically, electron energy loss spectroscopy (EELS) has not generally been used for these systems since their characteristic edges in the EELS spectrum are at relatively high energy (>1 keV) which require high brightness sources and stable instruments to record. However, analyzing materials containing heavy elements using EELS would be very beneficial given the wealth of information contained in the EELS spectrum compared to only the relative composition given by EDS analysis. In addition to the simple compositional distribution which is available with both EELS and EDS, EELS can give insight into the nanoscale chemistry, bonding, optical properties and thickness/density changes of the material. This information cannot be obtained using EDS. With the advancements in aberration-corrected transmission electron microscopy the resolution in STEM has been enormously improved. More importantly, the reduction of the probe size and the dramatic increase of the probe current lead to the capability of acquiring high resolution elemental and chemical maps using EELS at energy losses previously thought nearly impossible. With these advances, there is so much current in these sub-nanometer probes that fast EELS spectra with good signal-to-noise ratio can now be acquired from the high energy portion of the EELS spectrum for heavy elements such as Au in just a few milliseconds. High spatial resolution EELS maps can now be easily acquired with the acquisition time to a large part limited by the speed of the EELS spectrometer. The introduction of fast EELS spectrometers such as the GIF Quantum® system has dramatically changed the rate that information can be recorded in an EELS spectrum imaging (SI) dataset. EELS maps can be acquired at over 1000 spectra per second that allows fully take advantage of the increased probe current available in an aberration probe corrected microscope. In addition, the multipole optics present in the GIF Quantum correct the aberration up to the 5th order allowing the use of high collection angles maintaining high energy resolution. Matching the collection angle to the large STEM probe angles available today is critically important in high energy loss experiments. Another feature available in the GIF Quantum system is the DualEELS™ capability that allows acquire simultaneously the low- and core-loss regions of the EELS spectrum under the same experimental conditions. Having the low-loss region of the EELS spectrum allows the determination of the absolute number of atoms present in the sample, the correction for any multiple scattering in the sample and the accurate measurement of chemical shifts due to variations in the local chemistry. In addition, optical excitations that are confined in the low-loss region of the electron energy loss spectrum are available for analysis. This has been critically in understanding surface plasmon effects in metallic nanoparticles for example. Au/Pd nanoparticles sample was provided by Professor Jianfang Wang’s Group at the Chinese University at Hong Kong. Data was acquired using a probe corrected FEI Titan Cubed 80-300 equipped with a high brightness X-FEG electron source and a GIF Quantum ERS as EELS spectrometer. EELS data was acquired in STEM mode using a ~0.2 nm probe containing over 200 pA of current. The probe convergence angle was 25 mrad and the collection angle over 100 mrad. The actual collection angle was not directly measured but estimated based on the microscope camera length and the EELS spectrometer entrance aperture used for the experiment. EELS SI analysis was carried out in DualEELS mode and the regions of the EELS spectrum from 0 eV to 2000 eV and 1800 eV to 3800 were simultaneously acquired using acquisition times of 50 µs and 49 ms respectively. Therefore, the total acquisition time per each pixel was way less than 50 ms with better than 94% live time. Taking advantage of the fast acquisition mode available in the GIF Quantum system and the increased probe, over 55000 spectra (396 x 91 x 2) were acquired with the total acquisition time of just over 25 min from a very wide region as shown in Figure 1. The pixel size was 0.6 nm giving a slight under sampling of the data given the ~0.3 nm probe. Additional performance would have been achieved by increasing the probe size (the current) to better match the pixel size. The EELS SI data was acquired without any spatial drift correction applied showing the high stability of this microscope installation. Figure 2 shows the RGB map of the sample composition extracted from the Au M4,5-edges at 2206 eV and the Pd L2,3-edges at 3173 eV. Despite the high energy edges involved, the contrast in the RGB map is very high and clearly shows where Pd and Au are localized with great detail. This is due to the large cross-section for these edges, the low background at high energy losses and the inherent local nature of the EELS scattering process. The EELS signal can only be generated at the position of the electron beam and never from secondary scattering fluorescence from other areas of the sample. As indicated above, data was acquired in DualEELS mode. In this way, it is possible to have the information from the low-loss region of the spectrum that allows get the information provided by the plasmon along with the zero-loss peak (ZLP) in the same dataset. Plural scattering in the Au M4,5-edges and the Pd L2,3-edges can now be deconvolved to obtain the single scattering contribution. This is shown in Figures 3 and 4. Given the zero-loss and low-loss portions of the spectrum, the absolute thickness for the whole particle can be obtained as shown in Figure 5. In conclusion, fast atomic EELS maps with high contrast can now be acquired with a good signal-to-noise ratio. Using the GIF Quantum in DualEELS mode allows the simultaneous acquisition of two different regions of the EELS spectrum. The low- and the core-loss regions of the EELS spectrum were acquired. This is very beneficial as additional information can be obtained. It is also possible to acquire two regions in the core-loss portion of the EELS spectrum containing the Au M4,5-edges at 2206 eV and the Pd M4,5-edges at 335 eV respectively.